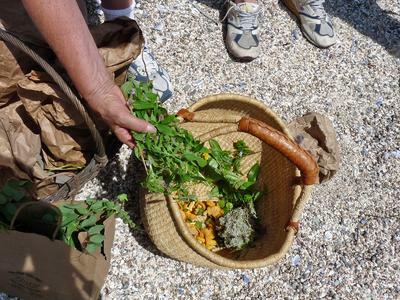 Lamb’s quarters are added to a basket that already has bayberry leaves and Irish moss in it during a foraging tour of Russ Island held August 7. Photo by Alice Wilkinson Order prints of selected PBP photos. On a brilliantly sunny and clear day, August 7, about 12 people travelled to Russ Island to see what there was to eat. The foraging trip, organized by the Island Culinary and Ecological Center, spearheaded by founder Ingrid Bengis, featured Ross Florance of Per Se restaurant in New York City. Micah Woodcock of Atlantic Holdfast Seaweed ferried about 10 people to the island, where they promptly dispersed and began scanning the perimeter of the woods for edibles. The first visible edibles were right at the edge of the landing. Lamb’s quarters (known to gardeners as pigweed), growing in abundance, was quickly stuffed into paper bags Bengis supplied and baskets and plastic bags brought by others. In fact, much of which was gathered often ends up in compost piles as weeds, said Bengis. Next time your tomato bed is invaded by purslane, instead of hacking it out and throwing it away, gather it and put the leaves in a salad. As the pigweed was being gathered another attendee spotted wild mustard, easily identified by its sparse foliage and tiny yellow flowers. Brief experimentation revealed that the flowers have more taste than the hairy leaves. Some edibles, such as goosegrass, caused hesitation because they were past their prime, having turned into something like hay. The rose hips, though tempting, were far from being ripe, and were bitter and unappealing. Others, like seaweed right at the water’s edge, were left on the recommendation of Woodcock, who pointed out that they were sitting in stagnant water. Holley Mead, armed with the Peterson Guide to Edible Plants, found some chanterelle mushrooms, which she could identify anyway, and questioned whether the very pungent mint gathered was wild mint or pennyroyal. Climbing up a hill to the interior of the island revealed a small meadow, carpeted in part with cranberries, soon harvested. By the end of the hour and a half spent on the island, many kinds of edible vegetation had been spotted and gathered. The edible plants included beach pea leaves, lambs’ quarters, wild mint, wild mustard flowers, goosegrass, chanterelle mushrooms, cranberries, Irish moss, russala and boletus mushrooms (one of each), reindeer moss, purslane, green apples, sheep’s sorrel and wood sorrel. Some, like the rose petals, bayberry leaves, juniper berries, spruce cones and yarrow are used for flavoring and as fuel for smoking. A light meal was prepared later by Florance and Nicholas Ferreira, featuring local seafood, including herring and mussels. The mussels were smoked over seaweed supplied by Woodcock; the herring was served with pickled cranberries, and there were Bagaduce oysters cooked over seaweed and served with a daub of rose-vinegar gelee and a rose petal on top.